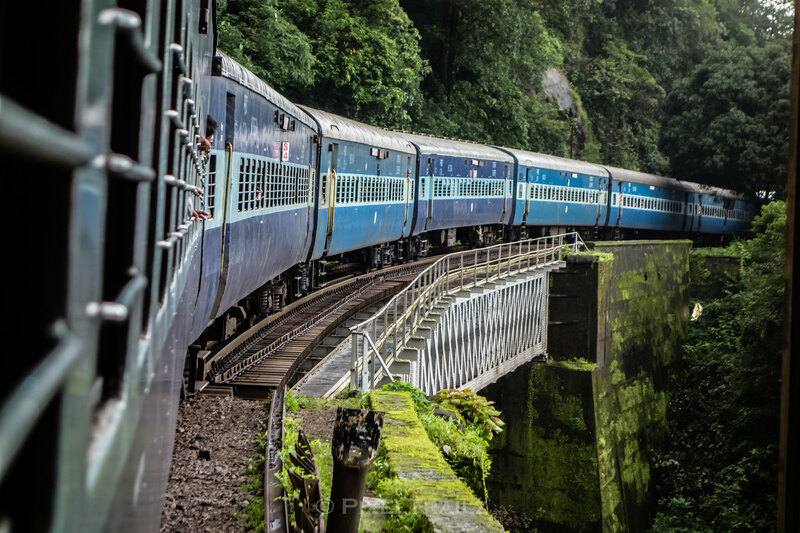 Timetables,websites,train punctuality history and every other detail was analyzed threadbare to help us find the best itinerary to take us to Honnavar & Back. 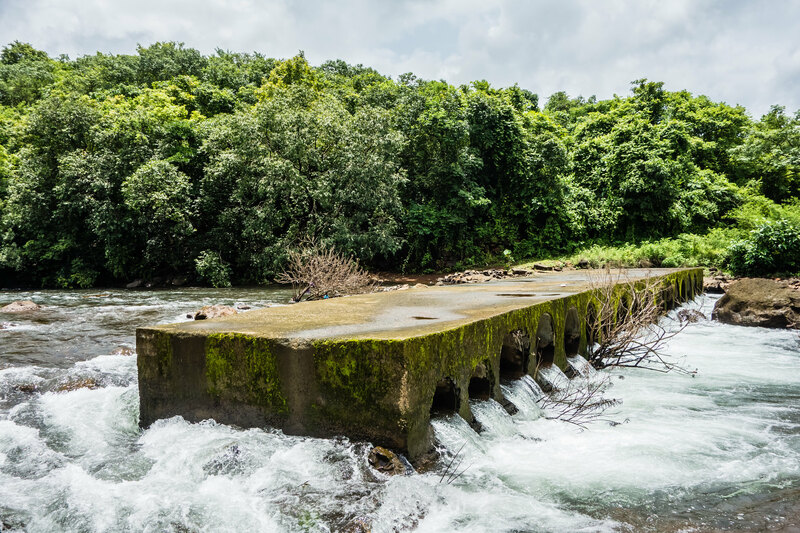 Sharavati river, bridge and the King TVC RAJ was incentive enough for us to narrow down to Honnavar, but the schedule and our subsequent return to Londa did not line up the way we would have loved to. 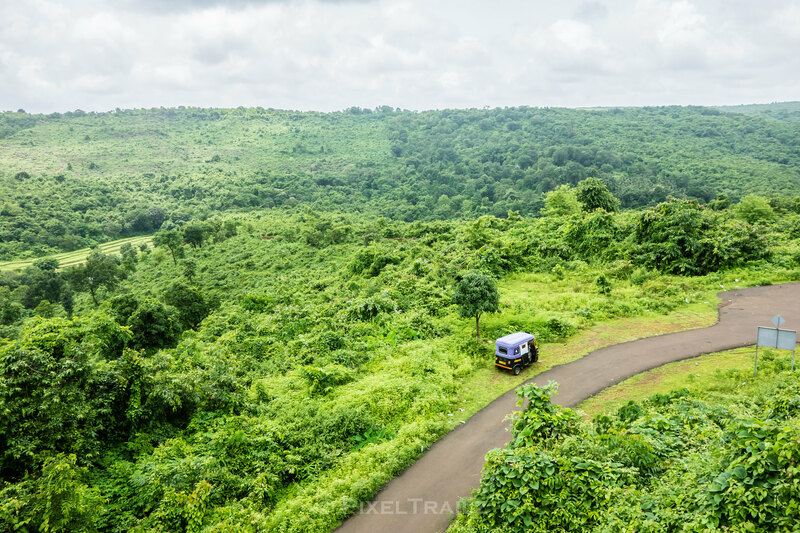 Halfheartedly we decided to take the scenic route towards Mangalore. 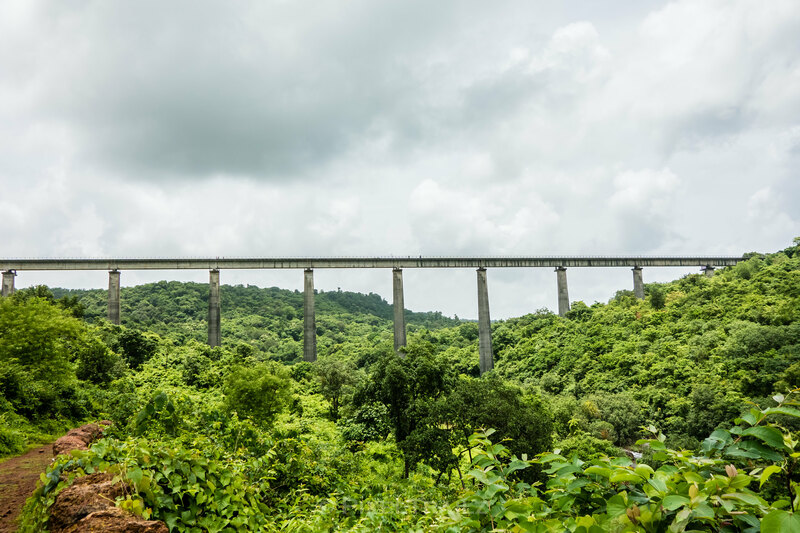 While this self debate was in the background, I had half a mind to take the north bound trains towards Ratnagiri and visit the Panval Viaduct, a Konkan Engineering marvel. With all this confusion and lack of conviction, we decided to call up the Real Konkan King and get his advice. 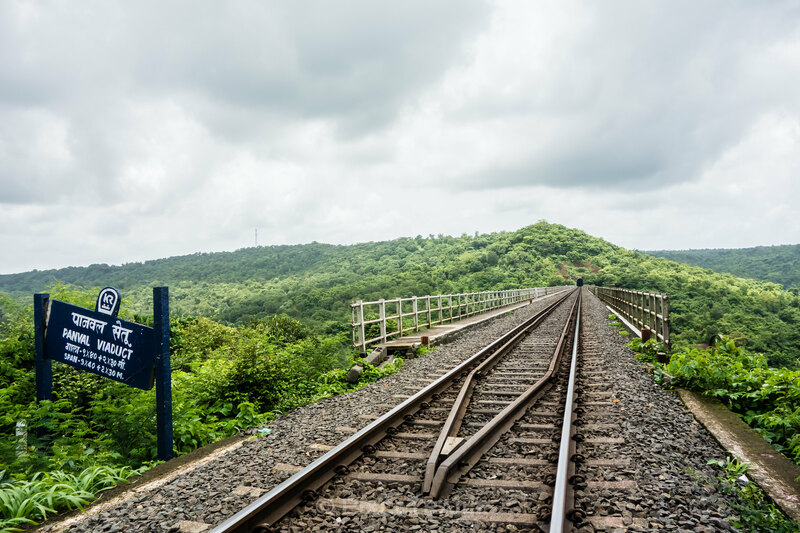 Who better to consult than the veteran who has spent years traversing the route and know the terrain and schedules inside out and it so turned out that he was scheduled to pilot the LTT bound Netravati Express from Madgaon to Ratnagiri the next day. With this information on hand, it turned out to be a no-brainer for us and Panval, here we come. The monsoon schedule ensured we had enough time for a good overnight rest and be ontime as the dawn breaks to board the Netravati to Ratnagiri. 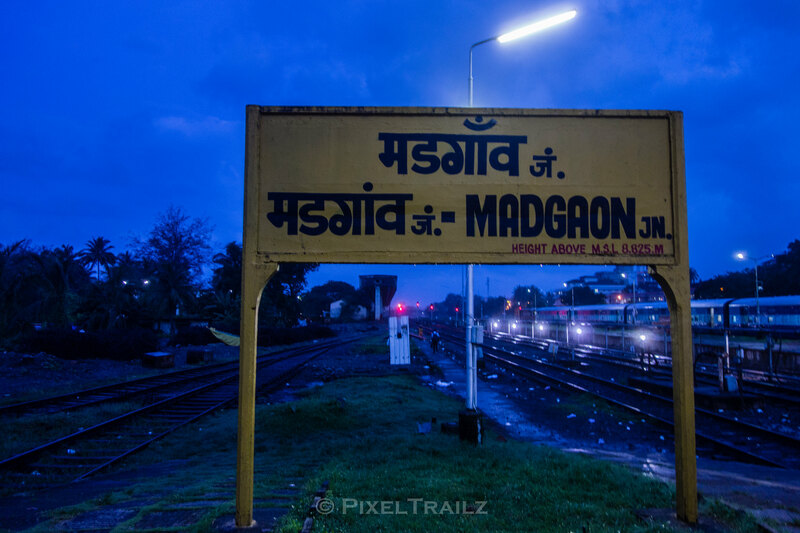 We reached Madgaon a good 30 minutes prior to expected arrival of 16346 and had a quick meet with our guide and well wisher for the day. 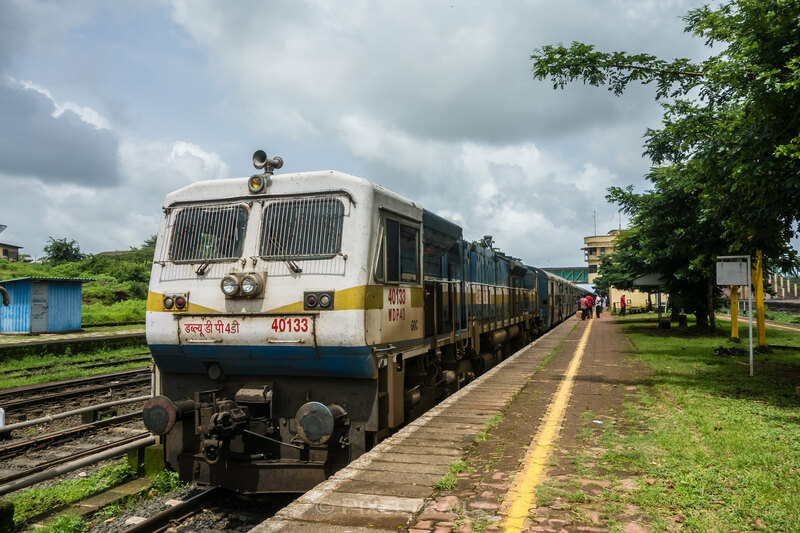 Netravati arrived with a GOC WDP-4D 40133 and after a quick change of crew soon departed Madgaon for an eventful five hour sprint across the wet, green and fresh Konkan coast. 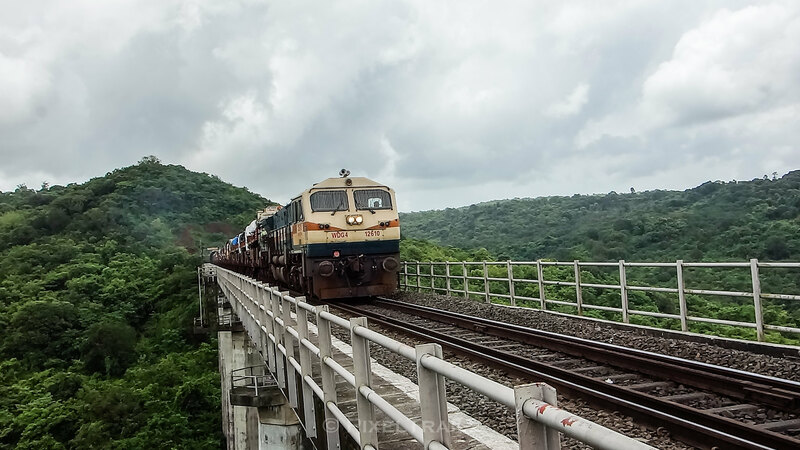 Zuari bridge, innumerable bridges and viaducts, streams flowing with fresh water all over the place, overcast skies and intermittent heavy showers, busy crossings, RORO overtakes, Tunnels and the quaint and peaceful stations. Phew, what a delightful journey. 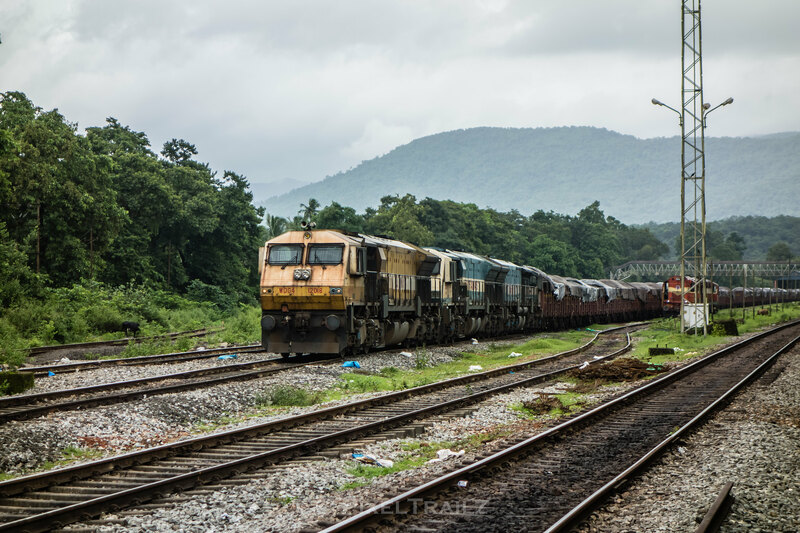 As we cruised past the greenbelt at a sedate 75-90 kmph due to monsoon timetable, we were keeping track of the other Konkan King, the south bound TVC Raj awaiting a smoking crossing at Nivasar. As expected, we were looped into Nivasar for the crossing, however as we were just about to come to a complete halt, the mid mounted headlights of the toaster beams out of the long 4km Tike tunnel. Netravati had just cleared the mainline, but it was too late for the RAJ to smoke through the mainline. A sedate and relaxed loop crossing with the mainline clear. 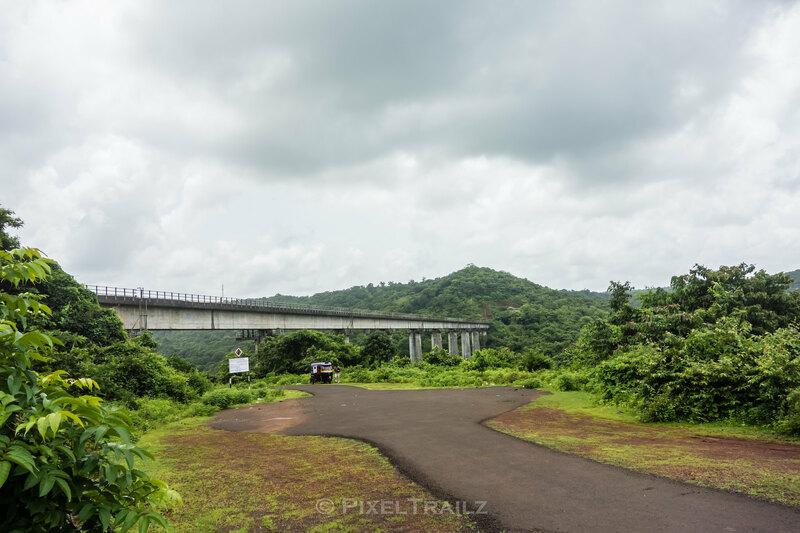 Ratnagiri arrived on dot and our Netravati Pilot, the other Konkan King helps us out of the station and after a long chat with the auto rickshaw driver, sends us off packing to the Panval Viaduct (Panval Nadi). The arrangement was to take us to Panval Viaduct, wait a bit while we explore the Viaduct and its surrounding, click at least one pic with a train on the viaduct and drop us back at the station. After a bone rattling ride for about 20 minutes, we found ourselves looking at the viaduct in awe. Sensing our lack of understanding of the terrain and geography around the region, the auto driver decided to accompany us and become our guide for the next hour or so. 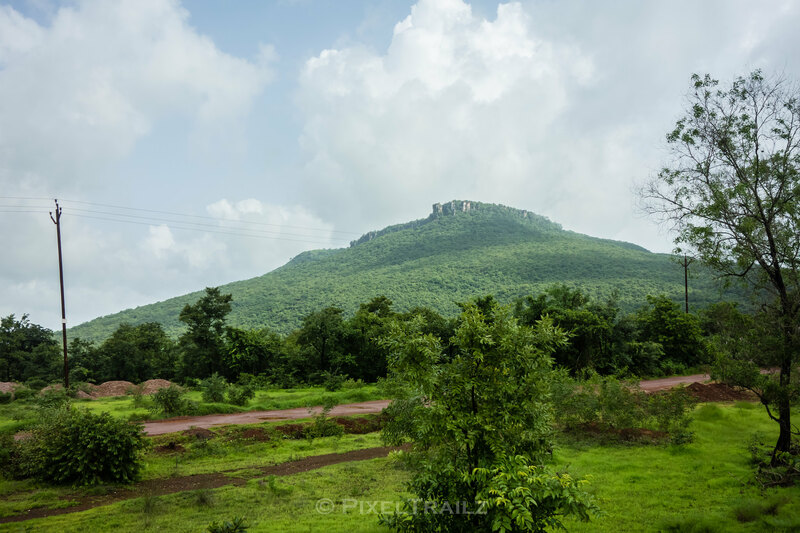 We follow him along the road and start climbing an uneven and steep set of stairs hidden and surrounded by dense green foliage. 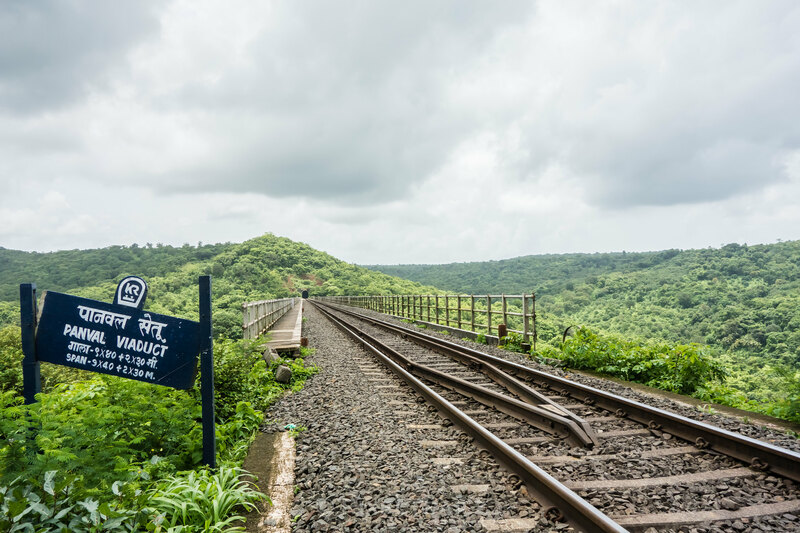 Slightly more than a couple of minutes later we found ourselves on the railway tracks looking straight ahead into the Nivasar end of the Panval Viaduct. Oh boy! that was a breathtaking scene. 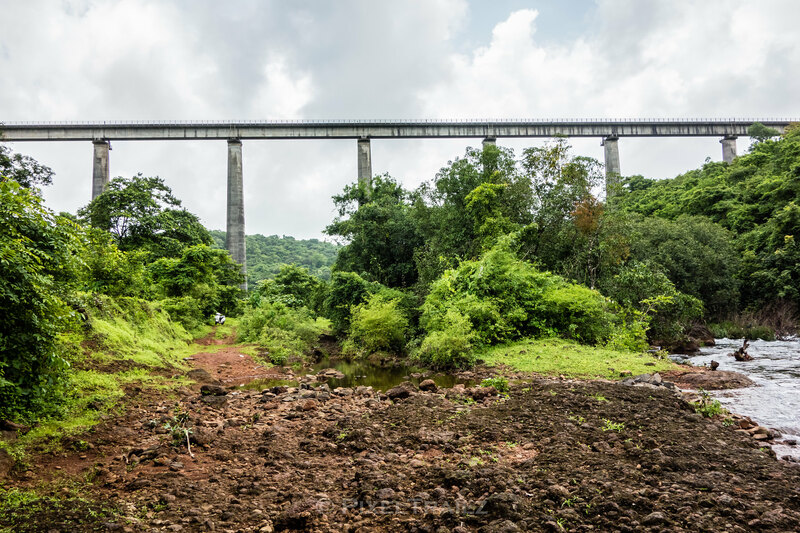 We decide to walk along pathway on the leftside of the viaduct to have a more panoramic view of the valley below and the Panvel river cheerfully rushing past. Some sight to behold. Nature’s beauty at its best. Absolute silence only disturbed by heavy winds, chirping birds and the river below. I am just waiting for someone to question me again “Why do you keep traveling by train to random locations ? Don’t you have anything better to do ? Is that even a hobby ? Is it worth it ?”. Well, this is not a hobby for me. 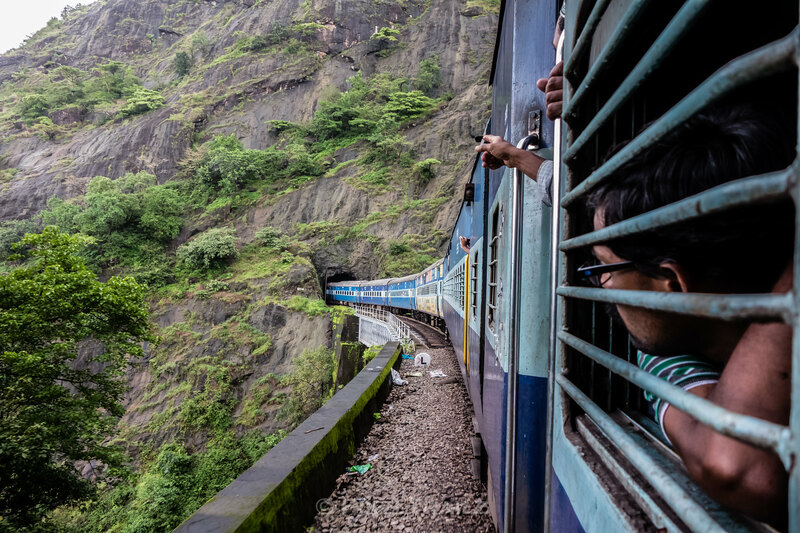 This is my passion and what better option to reach such locations except by Indian Railways, which connects us all in one way or the other ?. 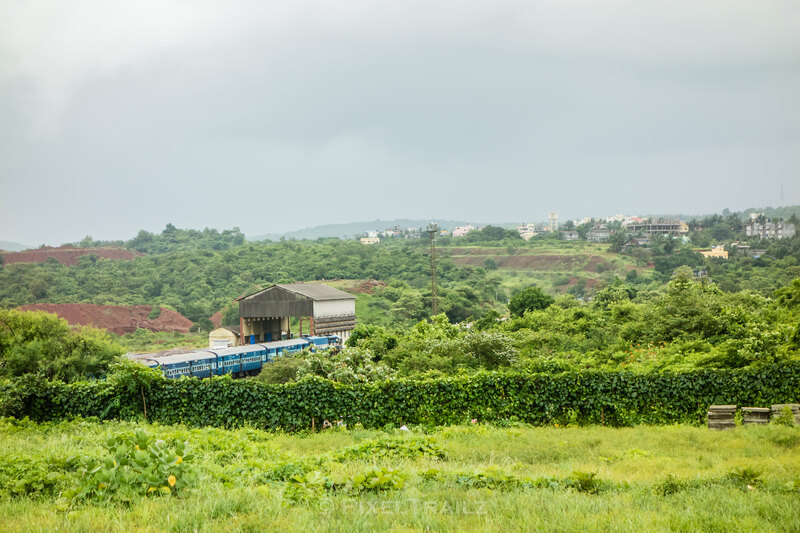 We overtook a RORO (Roll On Roll Off) en route to Ratnagiri and was expecting it to storm past us on the viaduct anytime now. The tracks were absolutely dead straight and we could see a faint mid mounted light in the distance. Even though we had enough space along the viaduct , we moved into one of the relief points for a better view and well a few degrees safer as well. The vibrations intensify as the RORO approaches. It storms out of the tunnels and screams past us like an angry monster. 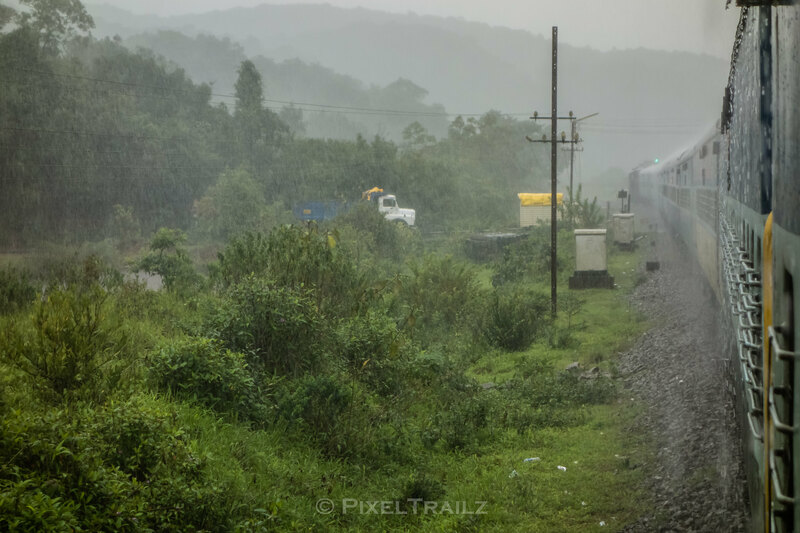 Thundering vibrations and a roaring EMD left behind a mini earthquake and two breathless spectators in its wake as it rushed towards Ratnagiri with a trainload of trucks and a bunch of amused drivers. It is time now to witness this spectacle from the valley below. 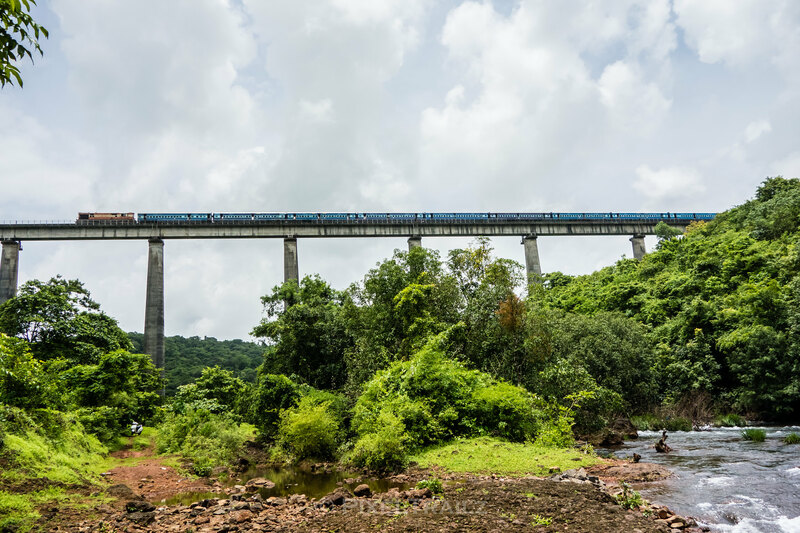 Once again our gracious auto guide led us through another set of dense foliage and hidden stairs and after nearly 10 minutes we were now right below the viaduct with the Panvel river flowing past us. Looking for a vantage point we moved away to get a better view of the viaduct. We checked the current location of Sawantvadi Road – Diva passenger and our estimation was that it should be passing the viaduct in the next 15-20 minutes or thereabouts. I was now caught in a dilemma. Should I take a still picture or a video of the train passing over the viaduct. I could do both simultaneously as well with my camera, but the still picture quality gets compromised. So I took out my cellphone and decided to shoot a video with my left hand and a still pic with my camera on my right. Ten minutes passed by while we freshened ourselves and now the wait starts. With the cellphone on my left and a camera on my right and anxious not to miss the moment, every second seemed like a minute. A couple of minutes pass and both my hands start shaking. Deciding not to miss the moment, I shove the cellphone onto my jeans back pocket and no sooner did I do that, a distant chugging sound set us up. The Diva bound passenger quickly rushes out of the tunnel and boy the massive train looked like a toy car on that viaduct. Now I was able to really understand the “scale” of the viaduct. Indeed an engineering marvel in a very difficult terrain. The return to the top where our auto was waiting was exhausting to say the least. The lack of any physical activity was evident by the time we reached the top. Our gracious guide offered us some tea on the way back which we politely refused as we were running a bit late. 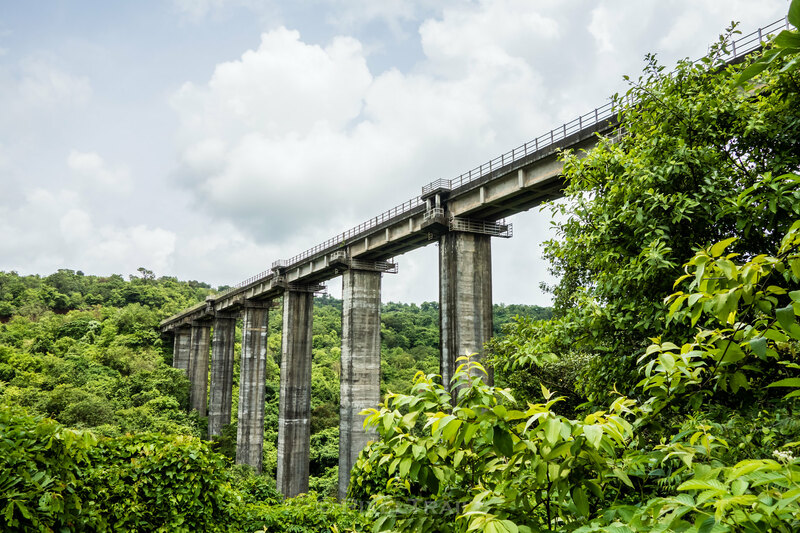 Seeing our enthusiasm and excitement, he decided to take us up to the Kuwarbao Viaduct as well through a road which he avoided earlier due to its pathetic condition. A bit of history lesson from him and a short while later, we were back again to Ratnagiri station, a ride which definitely tested all our bones and joints. We ended up paying him a bit more, which he politely refused, with no effect. We took his number (Which was put to good use in future) and called our Konkan King who had been waiting for us to accompany him for lunch. A sumptuous lunch, a bit of small talk and we decided not to let him wait anymore and shorten his much needed rest as close to another 800-1000 Madgaon bound passenger’s lives depended on him later that day. 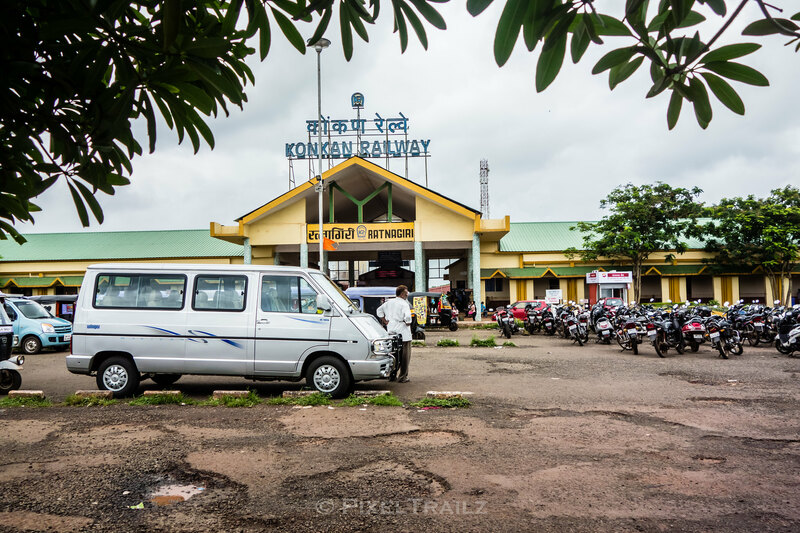 We thanked our Konkan King and got a couple of Alphonso extracts and tickets back to Madgaon awaiting Mandovi from Mumbai.We needed a short rest as well and the 3A coaches of Mandovi were not quite brimming with passengers. The TTE let us enter into one of the 3A coaches and make ourselves comfortable wherever we felt like. 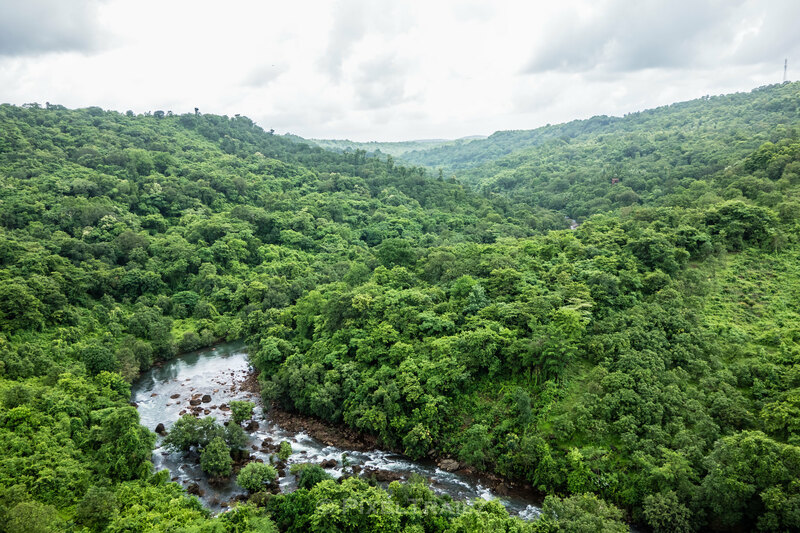 Mandovi has a reputation. 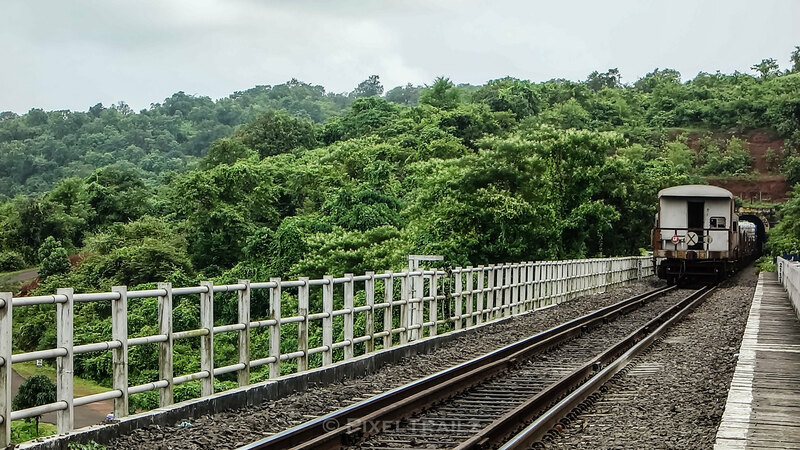 It takes its own sweet time on the Konkan cruising through at a relaxed speed. Once we started indulging in the Pantry food served, the reason was apparent. Every single dish served was delight to the taste buds. Impeccably and freshly prepared and very light on your wallet. For the next 3 hours, our sole purpose now was to binge. Once we decided we could not take anymore, a blissful sleep for the next couple of hours and we are now almost back to Madgaon. After a refreshingly tired day, it was time again to be a part of the Goan spirit. 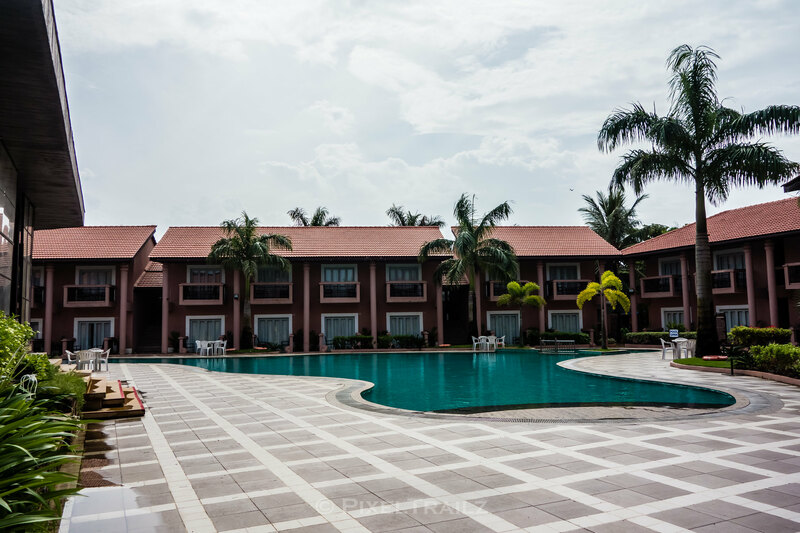 The late evening was spent rewinding and reliving the moments in a relaxed dining environment, post which we had to pack as we needed to get out of the hotel around 6AM to spend some time at Suravli before starting our return journey back to Bangalore. As the clock ticked past 10PM, the morning exertion surfaced itself and we decided to call it a day. The alarm was bang on time. 2 snoozes and the tenacity it displayed left us with no choice but to get out of bed. With still another hour to checkout, I had the luxury of hitting the snooze again and 10 minutes later, I was there getting ready for the trip back home. Breakfast and our cab was waiting and after our checkout formalities, we found a safe place for our luggage at Madgaon cloak room. Equipping us with just what we needed for this session, we continued our way to Suravli, a nondescript station right after Madgaon towards Mumbai. 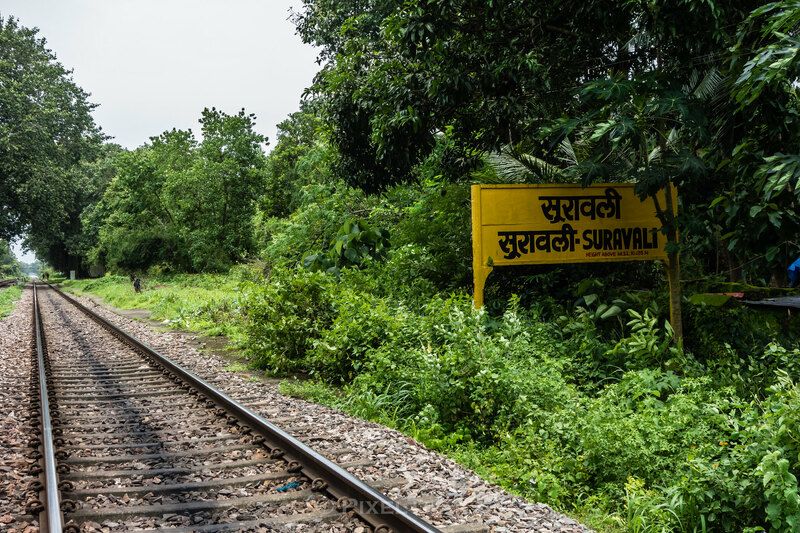 It is unfair to classify Suravli (Formerly Seraulim) as a railway station. It is more like unpaved footpath on either sides flanked all across with trees and plantation. A canopy of overhanging branches of large trees almost create a tunnel like effect for the trains passing through. No trains stop here except for a few passenger trains every 2-3 hours. 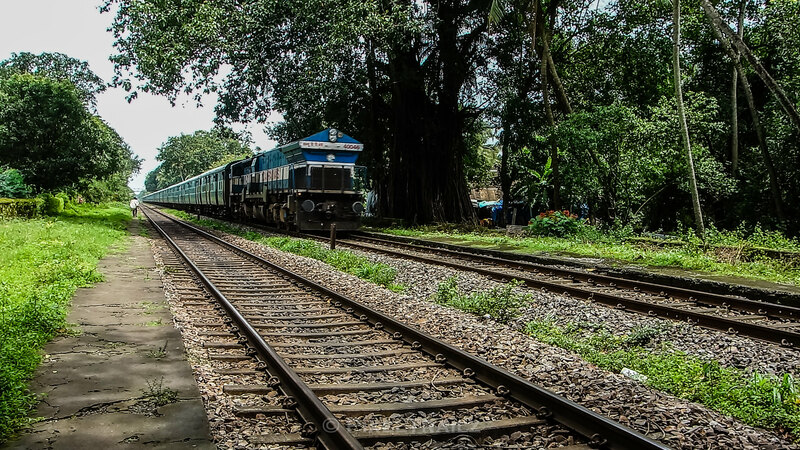 A perfect place to hangout with a good book in hand and see time fly by only to be disturbed every now and then with scream of EMD’s, ALCO’s and the typical clickety clack of trains as they rush through the rail joints. 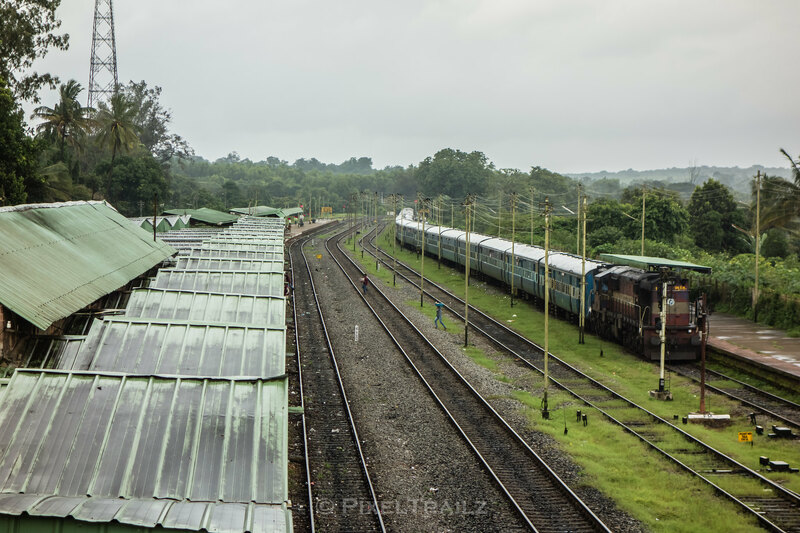 Konkan Kanya, Dadar Jan Shatabdi, Goa Sammpark Kranti, Trivandrum Veraval & a coal laden BCNA were witnesses to our 90 minutes of laid back and lazy trainspotting. With lunch time around, our digestive system started grumbling lest our laziness gets transferred. We bid Suravli goodbye and took a mini bus to Madgaon. 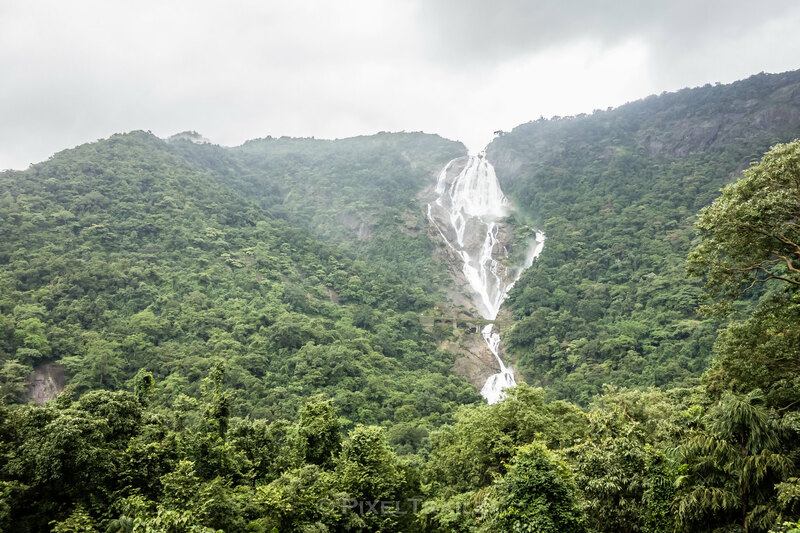 Quickly finished lunch on one of the platform eatouts, retrieved our luggage and now boarded back on the same train which got us to Madgaon which is now on its way back home.Half an hour later, we pulled out awaiting to witness the grand Dudhsagar once again. Two bankers were waiting for us at Kulem, another beautiful station. 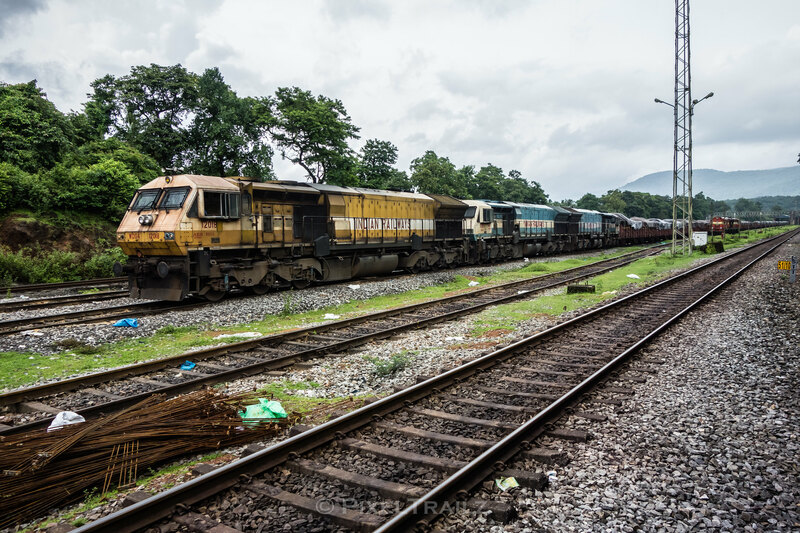 We met another group of rail enthusiasts at Sawantvadi Road the previous day on our way back to Goa, who despite being warned and informed wanted to trek to Dudhsagar. 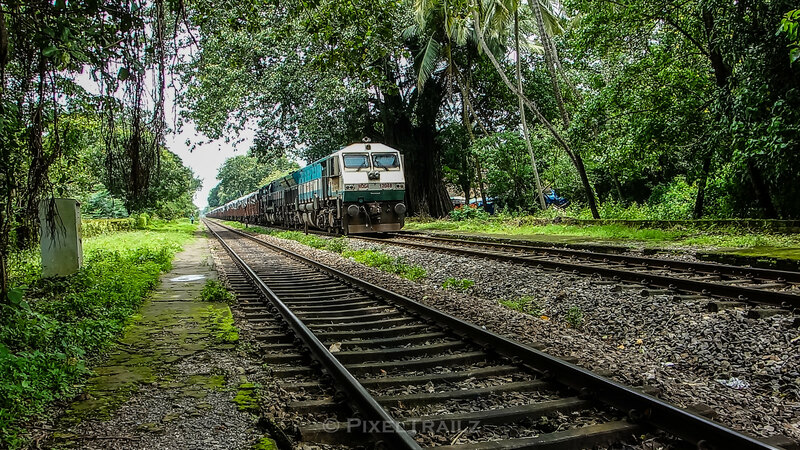 Dudhsagar is off limits now and it was mentioned in no uncertain terms all over Kulem Railway Station and they had no option but to deboard. The bankers did a good job of pushing us up with full vigor and soon we were crossing the Dudhsagar again. 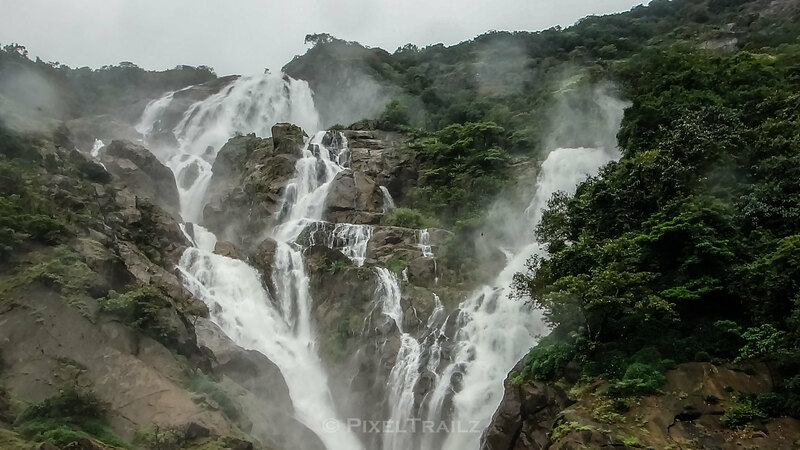 Every time you see Dudhsagar, it knocks you off completely and this time was no exception either. Soon enough we reached CastleRock where the bankers were detached and we pulled out under one of the heaviest downpours we witnessed in this entire trip. We were dumped unceremoniously on PF 3 at Londa Junction. It was a clear indication on what they intended to do with this train and all the train attendants and coach attendants were out of the station in no time for some rejuvenation and refreshment. 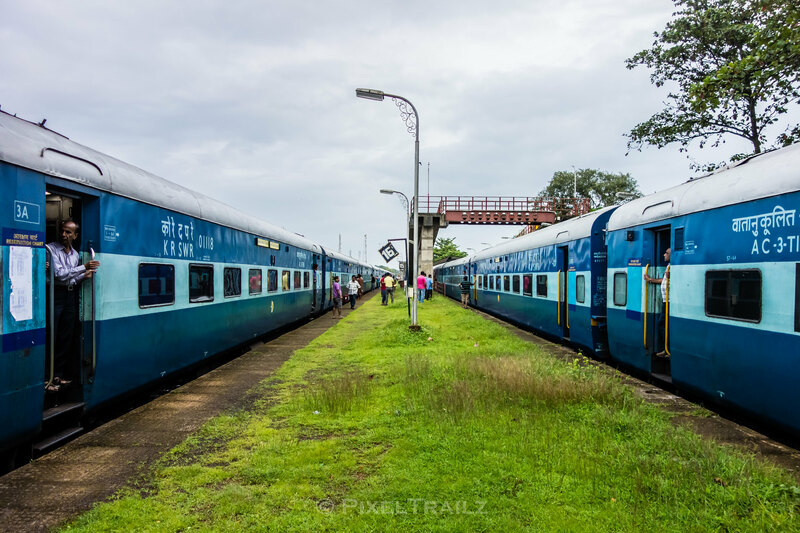 The passengers had to keep themselves amused with the activities going around at the station as it was held up there for more than an hour to accommodate various crossings, loco reversals and a few overtakes. 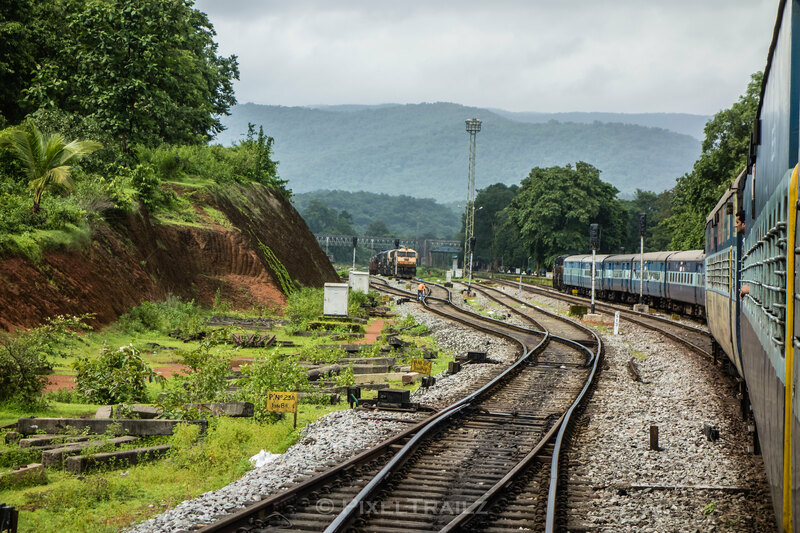 Londa Junction is another pure diesel haven with no poles blocking our views and is bestowed with beautiful curves before and after the station. 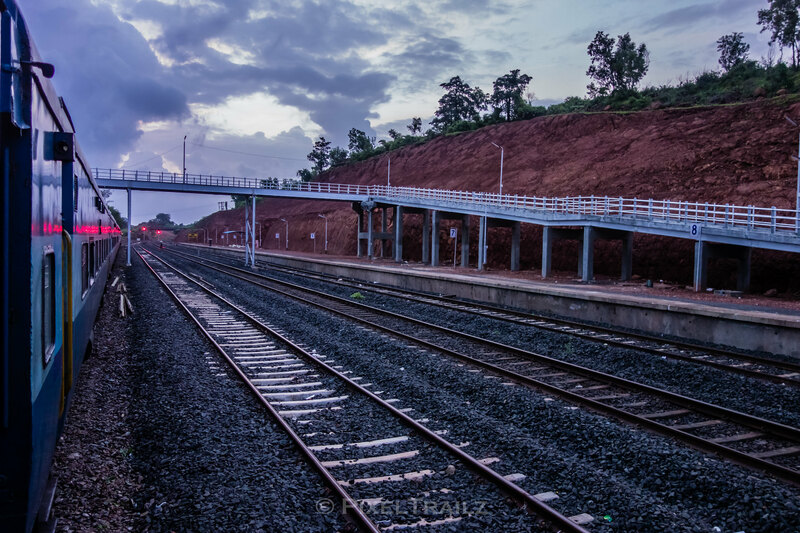 An empty and scary LTT bound Hubli – LTT express departed Londa after an exact 2 second halt. 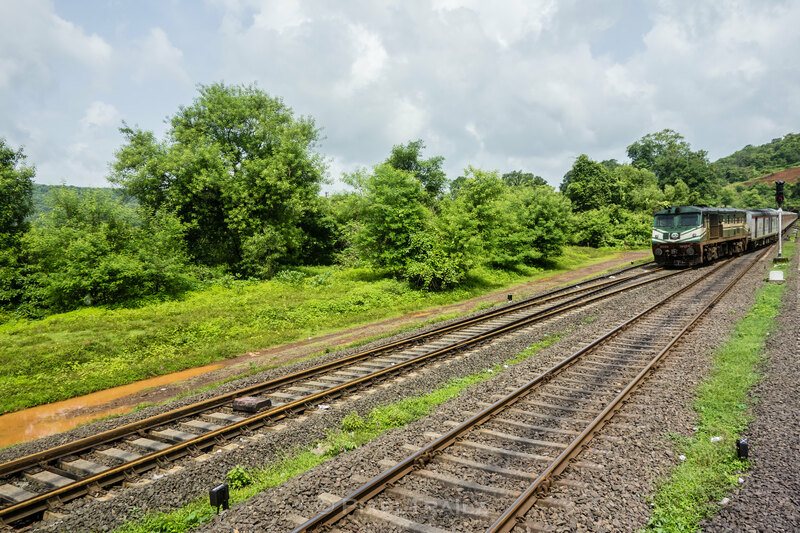 The puny 6 coach link express from Hubli to Nizamuddin soon arrived on PF1 with an overpowered UBL EMD beast around 6PM waiting to get linked to the Nizamuddin bound GOA – NZM Goa expresses, popularly and locally called as SUPER. Super arrived 10 minutes later on PF2 and then the circus started. 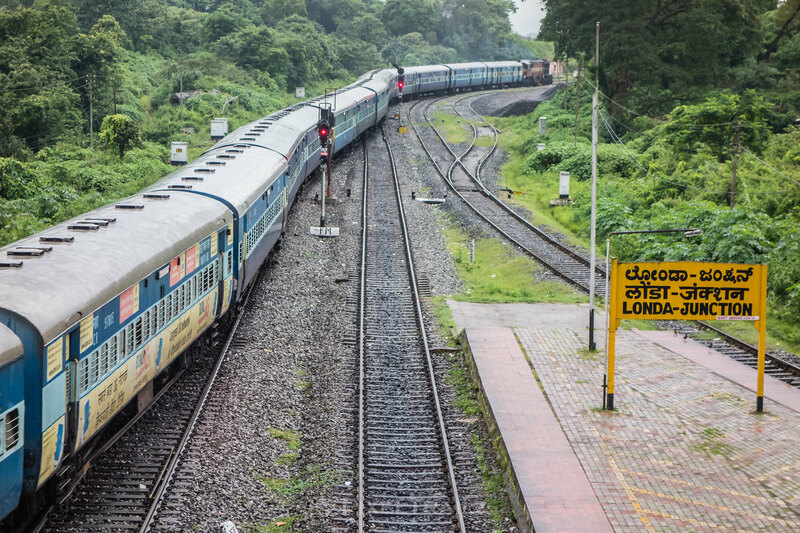 Super carries 3 coaches from Vasco to Bangalore which gets detached at Londa and gets attached to the SWR Queen Rani Chennamma. Londa operations now have their task cut out and the chaos sequence as follows. 2. It is now reversed and coupled to Super on PF1. 3. The 3 rear coaches of Super is now detached and the 9 coach combination now moves ahead from PF2. 4. The 3 rear coaches of the 9 coach combination is now detached and the 6 Nizamuddin bound link coaches moves out of PF1. 5. The 6 link coaches now reverse and gets attached to Super and now Super is all set to depart for Nizamuddin. Indeed,it is not expected that all passengers know about this game played at Londa. Lots of chaos and confusion prevails every time the coach composition moves ahead. 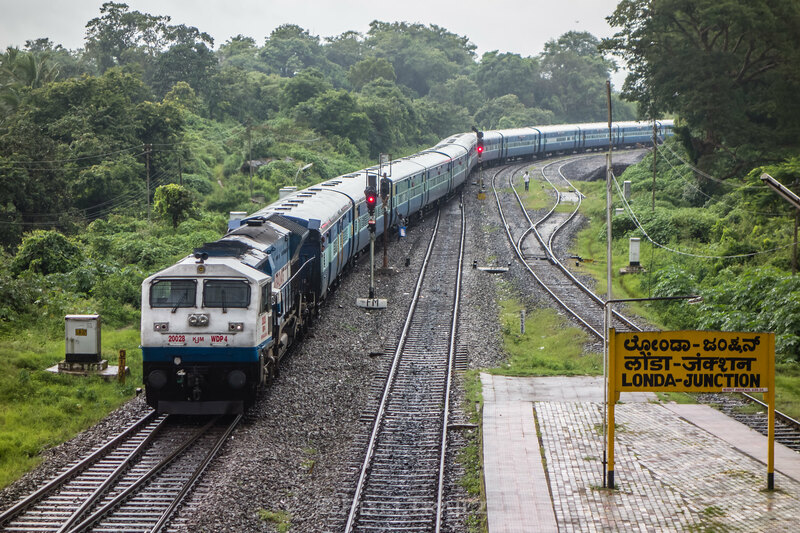 The station authorities sure have stories to tell their children and grandchildren about the Londa Puzzle.Super now departs leaving a stranded 3 coach combination on PF1 with dazzled passengers and we move out for some snacks and tea. All this while our sidelined Poorna express have been a silent spectator waiting for its starter. 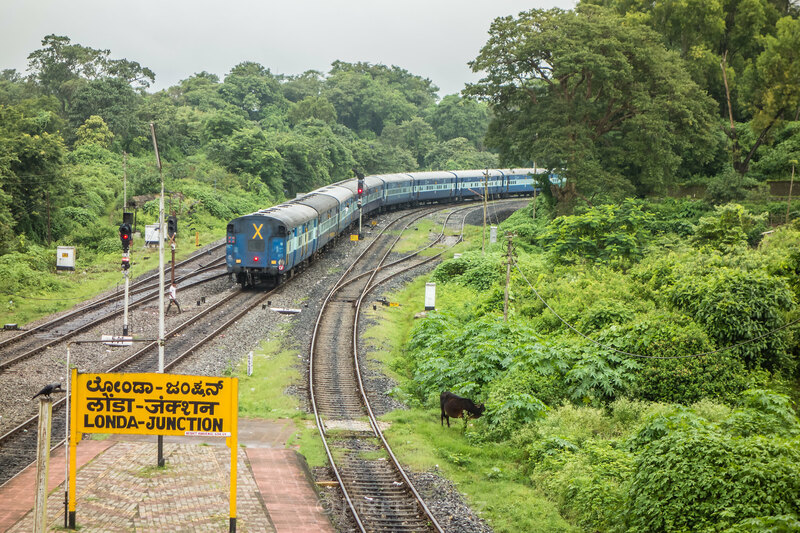 With no starter in sight, it was evident that with all the slack built into its schedule, it was awaiting another crossing and after a long 30 minute wait, Mysore bound Swarna Jayanthi express skipped Londa as slowly as possbile to a visibly irritated and relieved Poorna express. Poorna soon gets a starter and dashes off before the controller could change his mind. Half an hour later, the queen of SWR, Rani Chennamma arrives with a UBL EMD and we quickly barge into the highest class IR could offer us. After 4 days of hectic trekking and hiking , a 1A travel is the warm chocolate sauce on a cold vanilla ice cream. A 2 Second Drama ! 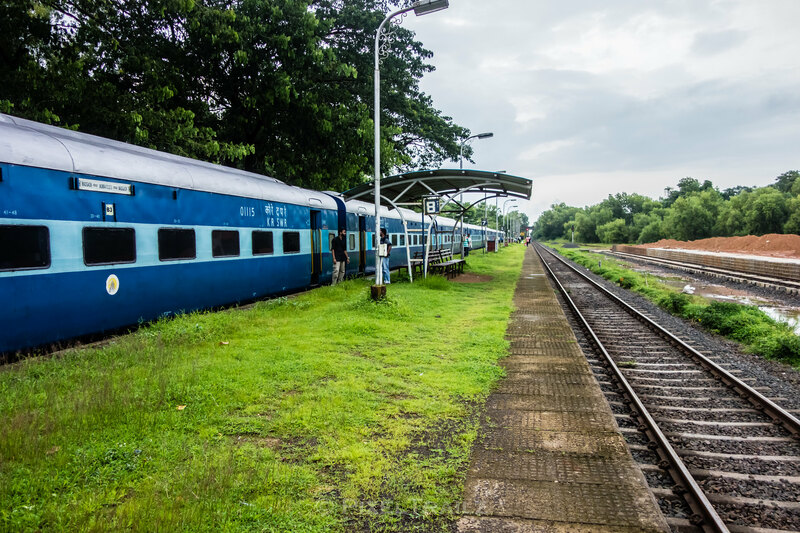 Dharwad, known for its famed Dharwad Pedas was almost witness to a fatal incident until someone pulled out a passenger just in time trying to board the moving train. We reach Hubli a good 30 minutes before time and the entire 1A coach was now filled with Railway Officials. Apparently all of them are traveling for some convention at Bangalore. Hubli being the divisional headquarters has no shortage of high officials and we were treated to all sorts of drama and theatrical expressions. Apparently some big shot was traveling in the same cabin as we were and in my personal opinion, I found it disgusting that a normal healthy male needed to have someone make his bedding, one to remove his shoes, one to endow his stinking feet now with slippers, one to help him provide the night suits, one to neatly pack and fold his formal wear, one to wait at the door awaiting fresh orders and what not. The irony of all this fake respect is the moment our “high official” is no longer in service, reality bites him and gets nothing but a indifferent from the same person standing outside waiting for his next order. Anyway, by the time the drama settled down, we were in dreamland only to be woken up 5 minutes prior to reaching our destination.